My music is not modern; it’s just badly played. Nevertheless, I doubt that anyone would question that there is something very challenging about playing a composition in which the composer can claim a rigorous logical argument behind every note. However, where this reduction ad absurdum of Schoenberg’s serial techniques is concerned, I think that Virgil Thomson made the right call in one of his pieces in The New York Review. The article was primarily about John Cage, and Thomson noted Cage taking the opposite strategy that every note in a composition would be determined by a rigorously applied aleatoric process. (Where Cage was concerned, that process usually involved tossing three coins to select a reading from the I Ching.) Thomson made the claim that the ear could not tell the difference between a product of absolute logic and one of absolute chance, and I think there is a sound point to make. The reason probably has to do, once again, with the fact that the music is not in the notes. It is in the actions that go into making music. As soon as a composer abstracts away from those actions, there are no perceptual criteria that can distinguish the absolutely determined from the totally random. Artificial life researchers used to say that this was a phenomenon that occupies just the right middle ground between these two extremes, describing that area as “the edge of chaos.” I find that more poetic that useful, as if it is yet another way to punt on how little we know about motivated action. The irony is that the time of Babbitt’s death may have coincided with a concert of compositions by Witold Lutosławski. The focus of the concert was on works based on aleatoric techniques! We thus had two events occupying opposite sides of a major aesthetic argument during the twentieth century. Lutosławski died in 1994; so I assume he has been waiting patiently in heaven to resume that argument with Babbitt. I wish both of them well in the afterlife! Reading Jason Epstein’s “Books: Onward to the Digital Revolution,” in the latest issue of The New York Review, is not a pleasant experience. His take on that revolution extends far beyond the “turf” he is examining, which was once the flourishing ground of independent bookstores and, as a corollary, the general publishing industry. However, he is not trying to lay all of the ills on the world and how the Internet has made that world; and it is the broader perspective that makes reading him all the more troubling. Far from dealing with structures of relationships, statistics deliberately and systematically disregard the relationships between the individual elements. It is, to repeat, concerned with the properties of the elements of the "collective", though not with the properties of particular elements, but with the frequency with which elements with certain properties occur among the total. And, what is more, it assumes that these properties are not systematically connected with the different ways in which the elements are related to each other. Reading is a highly personal matter. Reading interests and experiences may be shared; and, indeed, such sharing used to play a major role in community-building. However, communities are built because readers are individuals, not because they form some kind of “collective.” Every reader is one of Hayek’s “individual elements;” and those “elements” no longer signify in places like Borders any more than they do at Safeway. The company made money but this was a means, not an end. This is the unpleasant dinosaur in the room, so to speak. That sentence is not just about a publishing house or a bookstore or a supermarket. It is about just about any workplace we now encounter; and, if those grand designers of the World Economic Forum have their way, then it will be as true of any encounter in Yogyakarta as in Shaker Heights. The fact that “making the numbers” has become so fundamental to the rhetoric of business means that making money has “graduated” from being the means to being the end. This may then lead to the corollary that our global culture has become one in which we either cannot or will not turn our thoughts to any other ends. We may have become a worldwide society, but it is a society with severely impaired vision. That leaves only one question: Is that impaired vision the cause or the effect of a lifestyle that is no longer accommodates a reading public? I would like to request those who have invested or who are thinking of investing in Burma to put a premium on respect for the law ,on environmental and social factors, on the rights of workers, on job creation and on the promotion of technological skills. Will this have any effect? I tend to be pessimistic, but I have to remember that these are the words of a woman who has decades of experience in trying to talk to people determined not to listen. A book festival in Sri Lanka has been marred by a South African writer's withdrawal because of concerns over the country's human rights record. Damon Galgut heeded a boycott call against the Galle Literary Festival that was issued last week by a Paris-based campaign group. Reporters without Borders - a group campaigning for journalists' rights - made the call. It has been supported by lobby groups and well-known international writers. The festival curator and Sri Lankan novelist, Shyam Selvadurai, said he agreed there were disturbing human rights issues in the country. But he said that shutting down a literature festival was no answer. "I'm very sorry Mr Galgut dropped out because he has written about post-apartheid South Africa," he said. "And there would have been a lot for our people to have learnt from listening to him. And now by his dropping out, there is a void, a silence." Those attending seemed to agree with Mr Selvadurai's conclusions. "This event does a lot of good," one man said. "It probably has the freest speech available in itself. There have been very open debates about controversial issues at past events. It's exactly the wrong thing to shut down." This left me wondering who that “one man” is and whether he had requested that his identity be withheld. The implication appears to be that the Festival itself is a “safe area,” within which free speech may be practiced without fear of prosecution or any other form of attack. In other words it is a venue for free speech for a privileged elite over a limited period of time, making it the moral equivalent of a Potemkin village. Reporters without Borders believes in free speech for all individuals all of the time. I, for one, appreciate the spirit of their boycott if there is evidence that this fundamental principle is being violated. This is not unfamiliar ground. We have now accumulated several years of data to support the hypothesis the many of our most popular technologies, particularly the personal mobile ones, seem to have achieved popularity through their capacity to detach us from reality. This then raises the question of whether or not it is the responsibility of government to take action against “the detached” when they pose a hazard to others, if not themselves. In 2009 the question was whether Driving While Texting (DWT) should be declared a moving-violation traffic offense; but since then the playing field has expanded to all sorts of new opportunities to “tune out” the “annoyances” of reality. In California, State Sen. Joe Simitian has reintroduced a bill that would fine cyclists $20 for texting. In Oregon, State Rep. Michael Schaufler wants to fine cyclists $90 for wearing headphones or earbuds. In Virginia, lawmakers are considering whether to broaden such a ban to include any handheld communication device. And in New York, a bill before the legislature's transportation committee would ban the use of electronic devices while crossing streets. This is the second time State Sen. Carl Kruger has introduced this legislation to stem what he calls "tuning in and tuning out." As if to prove his point, a 21-year-old man listening to an iPod Nano in a crosswalk on Madison Avenue in New York last December was killed when a Mack truck backed into him and dragged him 30 feet. Presumably, the man did not hear the beeping of the truck in reverse. Apparently the opposition to dealing with this problem through legislation is not just strong but downright extreme. The world the Internet has made looks a little bit more like Deadwood every day (at least before Deadwood responded to external incentives to start taking governance seriously)! I suppose that at this time of year I tend to sound like a broken record as I continue to bash the World Economic Forum (WEF) for its incredible investment in self-admiration among the rich and mighty when they assemble for their annual gathering in Davos. Given the collective damage that these elites have done to our climate and given the way the climate has been pushing back by punishing the far-less-rich-and-mighty around the world even as I write this, it would be poetic justice for those conferees to get snowbound in their little retreat. The rest of us could then see what happens when the food runs out, not to mention electric power and (shudder!) Internet connectivity. I wonder, what kind of jawboning about “innovation” would take place then? Former Canadian Prime Minister Kim Campbell says the obstacle to quicker progress is the WEF itself. “If you want to insist on only the CEOs and the very top people, you get the same-old, same-old, same-old,” says Campbell, who chairs the international advisory board for the Kiev, Ukraine-based Foundation for Effective Governance and who attended Davos in the early 2000s when she was teaching at Harvard University. Has anyone checked the weather forecasts for Switzerland? After yesterday’s analysis of my Google Analytics numbers, I decided to run the risk of looking with a finer granularity. Yesterday I could draw some conclusions on the basis of then the articles were actually written. Today I decided to see just where attention was directed for page views on Sunday; and my “interest in local talent” hypothesis received some reinforcement. Two articles were almost perfectly tied for receiving the most page views yesterday. One was continued interest in Saturday’s MusicSources recital. However, the other was a “hot off the presses” announcement of the 2011 Hot Air Music Festival, a student-run eight-hour marathon event at the San Francisco Conservatory of Music with the ground rules that no music that is more than 50 years old be performed. Not too long ago Chloe Veltman used her blog to speculate that San Francisco is a city interested only in the very old or the very new, with much less interest in the intervening centuries. At the time I put a lot of thought into writing a rebuttal, as there seemed to be no shortage of opportunities to attend performances of music from the seventeenth, eighteenth, and nineteenth centuries. Now I suppose I shall be keeping a closer eye on my own data! I would like to believe that this offers some evidence that San Francisco listeners have a genuine interest in events that depart from the mainstream. Indeed, even the San Francisco Conservatory of Music may now have established itself as a mainstream organization. (I just noticed that the Faculty Artists Series recital I am attending this afternoon has sold out all of its tickets.) I am sure that these lesser-known organizations have their support groups; but, if the members of these support groups are taking the time to read about the concerts (even if the reading matter lacks the imprimatur of the San Francisco Chronicle), then support seems to go beyond just making donations and buying tickets. It involves a higher level of interest in just what is happening on the stage, which means that San Francisco provides a robust community for those who take their listening seriously. What’s good for General Motors is good for the USA! President Obama has asked me to chair his new President’s Council on Jobs and Competitiveness. The BBC News account was quick to observe that this appointment has not yet been formally announced by the White House (although that announcement may have taken place by the time this post is filed). It also notes that the new panel will replace the current Economic Recovery Advisory Board chaired by Paul Volker. Volker has not exactly been a cheerleader for recovery progress, as readers of publications that try to avoid any connection with the commercial private sector, such as The New York Review, know full well. So is this a matter of tearing down one henhouse and setting up another more conducive to foxes? At the very least there was something a bit Napoleonic about Immelt’s initiative in announcing his own appointment (even if it was more modest than Napoleon placing the Imperial Crown on his head by himself, rather than accepting it from the Pope). After all, as the Chairman and Chief Executive Officer of General Electric (GE), Immelt already has a somewhat imperial stature. On the other hand it is clear that Immelt wants to emphasize the name-change, since he is quite generous in his use of the noun “jobs” in his Washington Post The question is whether he is meaningfully generous. piece. After all, it was not that long ago that Immelt was talking about selling electricity-generating hardware to China; and this may be a good case study for where his interests really lie. If providing more electricity to China will depend on hardware manufactured in the United States, then at the very least this move can be view as a job-creator. The fact that those jobs are at GE is an inevitable corollary. Nevertheless, much of the hardware required cannot be easily transported, meaning that any job-creation is likely to be shared between the United States and China, probably under a common GE umbrella. So Immelt’s perspective on jobs for Main Street, USA may not be as sanguine as his writing would lead us to believe, particularly when we read down to his position on free-trade agreements and his casual dismissal of arguments that such agreements have eroded domestic manufacturing jobs. Immelt’s statement concludes with his own personal cheerleading for innovation. He sees innovation as an essential ingredient in the creation of new manufacturing jobs. This could indeed be the case if the country as a whole were to shift its priority back to a manufacturing economy, turning away from the glamorous modernism of an information economy. More likely, however, is that what will emerge is an economy grounded on some kind of synthesis of manufacturing and information; and the greatest risk is that the working conditions for such an economy will amount to a new generation of sweatshops of the sort I considered yesterday. Is this the sort of world of “jobs and competitiveness” that Barack Obama envisions for the United States of America? This morning we have news from the United Kingdom of knowledge workers who recognize that the work really does depend on the personal knowledge of individuals, rather than mere bits in computer storage. The story concerns Jobcentre Plus, which basically offers outsourcing for call center work. It turns out that the staff at seven of the Jobcentre Plus contact centers are taking industrial action today and tomorrow; and, according to the BBC News report, this will probably involve 3500 workers at sites in Newport, Glasgow, Bristol, Norwich, Sheffield, Makerfield near Wigan and Manchester. Ms Williams, PCS's national negotiator for Jobcentre Plus, said: "The two targets that matter to management are answering the calls and spending as little time as possible on the phone. "If a call takes too long, we get somebody telling us to finish the call. What we're saying is we should be able to use our judgement." She said staff were being monitored "every minute of the day", and unable to fully help clients on occasions because they were encouraged to keep phone calls so brief. "The reason we have chosen the seven sites is because we're all experienced benefit processors and understand the complexity of the benefit system. We know how the whole of the Jobcentre Plus system works," she added. She said the current conditions were demoralising for workers, with a staff turnover at the contact centres of around 20%. The union is also calling for more flexible working arrangements. Wolfram Research got its start with the hard-core Mathematica software, itself an offshoot of Stephen Wolfram's attempt to explain his mathematical view of the universe embodied in his book, A New Kind of Science. It was therefore fitting that the company's "knowledge engine," Wolfram Alpha, took a rigorous approach to facts and data. So perhaps it shouldn't have been a surprise that the company's first mobile application to use Alpha was similarly tailored for a refined audience and came with a correspondingly expensive price tag of $50. No doubt displeased with the response, Wolfram shortly after decided to "focus on ubiquity" and cut the price to $2. Now Wolfram is showing signs that indicate a deeper understanding of consumer sensibilities, announcing new iOS applications called Wolfram Course Assistants to help students with algebra, calculus, and music theory. They tap into Alpha's Mathematica abilities behind the scenes, but they're focused, packaged, and reasonably priced at $2 for algebra and music theory and $3 for calculus. Like just about everyone of my generation with an interest in computers, I have known about Mathematica for some time. Indeed, I was an undergraduate at the Massachusetts Institute of Technology when its pioneering predecessor, MATHLAB, first surfaced at The MITRE Corporation. There is no questioning that Mathematica was a great leap forward from MATHLAB; but, for the sort of research I was doing, I never needed to take that leap. Most of my work involved symbol manipulation but had little to do with the symbolic forms of higher mathematics. 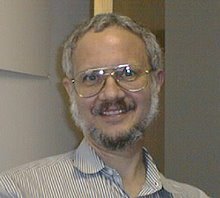 LISP was sufficient to serve my needs, and I am happy to say that I have never lost my capacity for expressing my computational needs in this programming language. Nevertheless, I was no more surprised than Shankland to see Wolfram venture into the wonderful world of apps; nor was I surprised that this would launch a debate similar to the one that arose when sophisticated pocket calculators first started appearing in classrooms. In this debate I continue to side with Seymour Papert, who, in his pioneering work on LOGO software as an educational tool, wrote a perceptive paper arguing that it was more important to teach children to “be mathematicians” than to teach them mathematics. I continue to believe that a good teacher can, indeed, teach students of any age to be mathematicians; and I accept the premise that software like Mathematica can contribute to that teaching process. Does it matter that bad teachers may misuse Mathematica? Of course it does, just as it matters that they may misuse pocket calculators, slide rules, and, for that matter, pencil and paper. Nevertheless, there are certain fundamental matters that really need to be covered from the very beginning. The most important of these pertain to listening, and I have to wonder whether or not they are being properly honored. The most challenging of these is the matter of enharmonic intervals. 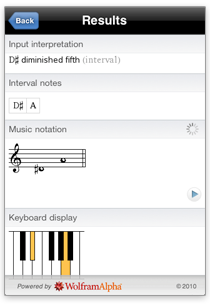 These are the intervals that sound the same when they are played on the keyboard of an instrument using equal-tempered tuning; and this tends to cultivate the misconception that enharmonics are nothing more than intervals spelled in different ways. However, those who practice music know that this is about as specious as the proposition that homonyms are words that mean the same thing spelled in different ways. It is thus important that even the earliest stages of ear training recognize that these differences involve more than spelling and that students begin to learn the logic behind what the proper spelling is. The mere fact that the interval training portion of the Course Assistant includes a keyboard display leaves me worrying that any sound synthesis provided by the software never gets beyond equal-tempered tuning and may ultimately mislead the beginning student. This then leads to the related question of how this software handles those “more advanced scales.” The sample display on the Web site indicates that one of these categories is “Grecian Scales.” Our knowledge of the music of Ancient Greece is very limited, particularly when it comes to how (if at all) it was notated and how it actually sounded. (The Wikipedia entry does not do a bad job at summarizing the current state of knowledge in this regard.) We know from sources like Aristeides and Ptolemy that the “music theory” of the Greeks was based on the interval of the perfect fourth, the interval between the third and fourth overtones in the natural harmonic series. This interval was divided into 60 equal parts. On the piano keyboard the perfect fourth consists of five semitones, which means that an equal-tempered semitone would be divided into 12 equal parts. Therefore, the entire octave would be divided into 144 equal parts, making it twice as refined as the EUTERPE system I developed for my own experiments in microtonality. Now it turns out that the term “enharmonic” can be traced back to the Greeks; but, given their refinement of the perfect fourth, it goes without saying that it refers to something more sophisticated than different ways of spelling the same interval! If the Wolfram app recognizes this sophistication, I shall be surprised; and I shall be even more surprised if the audio it provides is good enough to help the student recognize it too! All this may be a classic example of using a sledgehammer to crack a walnut, as one of my teachers used to say. However, the real purpose of the sledgehammer is not to pick nits over microtonal intervals but to generalize Papert’s precept. Teaching music is all about teach the students to be musicians. One must start with approaches to making music; and, through those approaches, one may introduce music theory for its capacity to facilitate how we can talk about making music. Such conversations can probably benefit from an easily consulted dictionary; and it would certainly be nice to have such a dictionary on a portable digital device (as it would be for a dictionary of the English language). It does not appear that the Wolfram app was intended to be such a dictionary; and, if it can serve as one, consulting it may not be as easy as we would expect from an English dictionary. I am not one for taking awards seriously, particularly in the domain of show business. However, I have been watching Melissa Leo ever since the days of Homicide and have never been disappointed in her performances. She knows how to command a role without commanding the spotlight; and, as a rule, one does not get very much recognition, let alone awards, for that kind of technique. So, while the London Telegraph may have preferred to focus on Helena Bonham Carter not getting the Best Supporting Actress Golden Globe, I think that a bit of attention should now be paid to an actress who was consistently doing good work long before the buzz began to start over The Fighter. Steve Buscemi is, of course, another actor who has been consistent in his technique. However, Boardwalk Empire is a case in which he could command both role and spotlight. From a historical point of view, this series unfolds a far more interesting narrative than that of The Sopranos, because it is a serious attempt to tell an “origins story” about the emergence of organized crime as we know it (and as J. Edgar Hoover staunchly tried to deny it). The very title of the series is a major clue; and, from a metaphorical point of view, the series probably gives a more comprehensive reading of Suetonius than Rome did (which is not to belittle the efforts that went into Rome or, for that matter, to promote Suetonius as a reliable historian). I am sure that most viewers came to Boardwalk Empire for its uncompromising take on the blood-and-guts violence of its period. However, what elevated the series above the ordinary was that same attention to detail that gave life to Rome; and, as an actor, Buscemi had the sort of technique required to make sure that no detail in his own character was unduly neglected. So that means that two awards went to performers of substance at a time when substance tends to take a back seat to special effects. I guess we just have to take our good news where we can find it these days. Yuja Wang seems to have been much on my mind lately. I suppose it all started when one of the “enthusiasts” who had felt so strongly (in a negative way) about the Examiner.com piece I wrote about Soyeon Lee’s Naumburg recital decided to cite Janos Gereben’s review for San Francisco Classical Voice as a stick to beat on my head. I rather enjoyed reading this piece (without having to sort out points of agreement and disagreement); but I found myself taking issue with the number of times Wang’s name appeared. There is, of course, no escaping the fact that we listen to every pianist in the context of past listening experiences of other pianists (not to mention the broader collective of all performing and recording musicians). (This is not the first time I have cited Abraham Lincoln’s observation that we cannot escape history to make a point about music.) On the other hand I have to confess that my only familiarity with the solo piano version of Maurice Ravel’s “La Valse” came from Wang’s Transformation CD, having missed her performance at her recital debut with San Francisco Performances in February of 2008. On the other hand Kelly Dean Hansen, who has been developing an extensive Web site of Brahms Listening Guides with meticulous and stimulating analyses sees a well-defined overall structural architecture in the version that Brahms published (Opus 35), beginning with the relationship between the two books and descending into the structure of each variation. Whom do you want to believe? Performers like Wang need to stop acting as if they know more than the composer. What interested me is that, once we clear away the invective, this still comes down to whom you wish to respect as your source. Hansen’s accusation that Wang was drawing upon her own judgment is a bit off the mark, since she was apparently following an approach that Arturo Benedetti Michelangeli (a pianist who was never afraid of controversy) had taken and had been documented in an old Melodram recording of a recital he had given in Warsaw in 1955. My own conclusion was that she was entitled to cast her lot with Michelangeli, probably knowing full well that there would be those like Hansen who would attack her for doing so. In the context of my own travails, the lesson seems to be that the very nature of music is going to engender a diversity of listening experiences, most of which are likely to entail strong opinions strongly held (in my favorite distortion of the words of futurist Paul Saffo). If either the diversity or the strength of those opinions is lacking, that tends to be a sign that the listening experience did not merit much attention in the first place. It goes back to my precept that one should write on the basis of what, in “Plato’s Pharmacy,” Jacques Derrida calls “living memory” (as opposed to memories “entombed” in artifacts such as written texts). If one then becomes embroiled in differences of opinion, one can at least fall back on the conviction that one’s position is an honest reflection of one’s “personal knowledge.” This does not protect one from sound arguments for refutation; but it means that any such refutation will, itself, become part of that “personal knowledge,” rather than simply an excuse for picking a fight. I have been taking a fair amount of flack over at Examiner.com regarding the piece I wrote about Soyeon Lee’s Naumburg recital this past Sunday afternoon. The bottom line was that I was totally blown away by her performance of an etude by Unsuk Chin entitled “Grains” and lukewarm, at best, about everything else on the program. What got me in trouble was my scientific tendency to diagnose why I had reacted this way. I thus decided to advance the conjecture that “Grains” worked as well as it did because of Lee’s command of the underlying metric pulse, while everything else on the program depended less on metre and more on a grasp of rhythm that would not be slavishly dependent on such a pulse. Even if this was no more than a conjecture, it was enough to open the floodgates of wrath, leading to the largest number of comments any of my Examiner.com pieces have received, with the negative ones in an overwhelming majority. The problem with this conjecture is that not everyone in the audience wants to be such a listener. There is this whole other category that probably covers the lion’s share of the seats in the audience, and that is the category of the enthusiasts. These people are extremely important to the business side of music, because they tend to be the ones who feel most strongly about the tickets they buy. There are, of course, any number of “targets” for such enthusiasm. Performers tend to be the most popular, but people can be enthusiastic about a composer or even about a single composition. The problem is that everything then rides on enthusiasm as the basis for a judgment call, particularly when that judgment involves spending money. Even a mere conjecture that challenges that call can be taken as an affront. At the very least it can lead to second thoughts about the monetary investment, but it can easy escalate to being taken as a personal attack. Given that just about everyone has this feeling of living on the edge these days, I can appreciate that most such folks are always on guard against any such attack, however insignificant the substance may be (although, where enthusiasm is concerned, part of the deal is that everything pertaining to that object of enthusiasm is significant). Apparently, inviting an alternative point of view can turn out to be a very risky business! Share a dirty joke with a friend! I was never a patron of the original Café La MaMa at 321 East Ninth Street in Manhattan, which Ellen Stewart opened in 1961. By the time I became a “regular,” Stewart’s organization had become the La MaMa Experimental Theatre Club (La MaMa E.T.C. ); and I was voraciously devouring performances at the facility on East Fourth Street, often satisfying my appetite for food and drink a short walk away at Max’s Kansas City. I cannot begin to enumerate all the events I attended, let alone choose any favorites. However, given my subsequent move into multimedia research, I suspect that my most salient memory was of a solo drum recital given by Max Roach during which an artist improvised images on a computer, which were projected behind Roach sitting at his drum set. This was all at a time when I also saw Harvey Fierstein’s Torch Song Trilogy on Broadway. I mention this in particular because Patrick Healy just posted an obituary for Ellen Stewart on the ArtsBeat blog of The New York Times, reporting that she died in Beth Israel Hospital this morning at the age of 91. Healy echoed the observation in the extended obituary that Torch Song Trilogy was created at La MaMa; but neither account mentions the background story in the Broadway program book, which claimed that Stewart’s first reaction to the first play in this set was to tell Fierstein that he was out of his mind (or words to that effect) if he expected her to let him perform under her banner. This was, of course, just her way of saying that the play still needed work. Fierstein went back to the drawing board (for those who know the second play, it might be more appropriate to say “went back to his knitting”); and the rest, as they say, is history. I suppose that what this anecdote says is that Stewart was never afraid of anything that was outrageously different. However, she was only interested in those who could be different without being boring. This would make her a model of that kind of connoisseurship that Fran Lebowitz valued so much in Martin Scorsese’s documentary Public Speaking. It is because it is increasingly hard to find people with that sense of value that Stewart will be missed. Man has been a hunter for thousands of years. In the course of countless pursuits he learned to reconstruct the shapes and movements of his invisible prey from tracks in the mud, broken branches, droppings of excrement, tufts of hair, entangled feathers, stagnating odors. He learned to sniff out, record, interpret, and classify such infinitesimal traces as trails of spittle. Such sentences would not be out of place in a refereed publication on cognitive science for any number of reasons; but I suspect that Ginzberg, as a practicing historian, would have seen “reconstruct” as the most crucial verb in this passage. This knowledge is characterized by the ability to move from apparently insignificant experiential data to a complex reality that cannot be experienced directly. And the data is always arranged by the observer in such a way as to produce a narrative sequence, which could be expressed most simply as “someone passed this way.” Perhaps the very idea of narrative (as distinct from the incantation, exorcism, or invocation) was born in a hunting society, from the experience of deciphering tracks. Considered in the context of Tucson, however, there must be more to the story. The FBI “hunters” now have their “prey,” Jared Lee Loughner. They know he “passed this way;” and they know what he did. However, as today’s news on National Public Radio’s Morning Edition made clear, FBI investigators still lack a narrative that will attribute any motive to Loughner’s acts, raising the question of whether they will ever be able to make sense of those acts as historians try to make sense of past events, whether it involves the assassination of Abraham Lincoln or the signing of the Declaration of Independence. Of course McMurtry has not solved the sensemaking problem that currently occupies the FBI. Ultimately, he is less occupied with explaining the past than he is with considering what is likely to happen next. My own reading is that he is concerned with the broader problem of a culture that tends to confuse “metaphorical truth” with “literal truth,” particularly when it comes to how we think about hunting. Thus, he cites that notorious map with crosshairs drawn up by Sarah Palin’s political action committee, adding parenthetically that Palin has sent a letter of sympathy to Giffords and that the crosshairs “aimed” as Tucson have been removed from the aforesaid map. And I don’t believe that language drawn from the hunt is likely to vanish from our political speech. Words such as “target” or “bulls eye” are deeply ingrained. We will be polite for a while but once the slugfest resumes—and politics is a slugfest—the old invective will slip back in. In other words there will be a requisite period of dignified mourning, after which the “slugfest” will resume; and history teaches us that the only slugfest that draws interest is one that also draws blood. There is something infantile about reading only for the comfort of experiencing what we already know. For all the bulk of Atlas Shrugged, I suspect one can apply that sentence to many, if not most, of its readers and probably all of its staunchest advocates. Rand herself declared that her Objectivist philosophy was grounded in egoism; but, in the midst of all of her professions to reason (which seem to have foundered on applying rigorous logic to false premises), hers is the egoism of the lower levels of Abraham Maslow's hierarchy of human needs, the levels concerned only with the self-satisfaction of deficiencies. As I wrote about Nicholas Carr back in 2008, if Google is not making us stupid, it is at least reducing us to a level of such self-indulgent infantilism in ways that I suspect Rand could not have ever dreamed. I have no problem with those who already know the story of Lord of the Rings and read it anyway; but I always thought that growing up was a matter of getting beyond the “false truths” communicated in books like Atlas Shrugged.